Regardless of what kind of swimmer you are, there is a specific kind of accomplished pride that accompanies making a lap from one side of the pool to the other. You can look back and think, “I did that.” Now, if you were a robot built by Liquid Robotics, you could look across an entire ocean and say that. Liquid Robotics is a California/Hawaii-based company that deals in, you guessed it, water-based robots, particularly their revolutionary Wave Glider, the first unmanned autonomous wave-powered robot. Last year, they sent out the Pacific Crossing (PacX) Wave Glider, nicknamed “Papa Mau,” from San Francisco, and over 9,000 miles and 365 days later, Papa Mau washed up to Hervey Bay near Bundaber, Queensland in Australia. 9,000 miles, people. Outside of spacecraft, I can’t think of another material item that wouldn’t be constantly malfunctioning, or even still working at all, by that point. Though the distance shattered the Guinness World Record, Papa Mau’s purpose is purely informational. Throughout the pre-navigated trip, it collected and transmitted untold amounts of never-before-accumulated data about those vast stretches of ocean over this kind of timeframe. One particular bit of study mentioned was its incredibly detailed data capture of 1,200 miles of a chlorophyll bloom along the Equatorial Pacific, which indicates a propagation of phytoplankton, a foundation of ocean life and climate regulation. It faced storms and notoriously strong currents, it faced sharks, it gave a hat tip to the Great Barrier Reef. It is amazing and it will eventually take over most of our brains, drowning those of us unchosen. While the whirligig beetle may not be the most interesting insect to watch for long periods of time, there is a calming effect in its swooning a path atop the water, alternating between motivated sashays and thoughtful drifts, like an ice skater suddenly capable of flight. Their movement will be mimicked in the development of a robot that will no doubt inspire a non-poetic dance craze. These Size-Undetermined Freakin’ Robots are being developed by Mingjun Zhang, Associate Professor of Mechanical, Aerospace, and Biomedical Engineering at the University of Tennessee, Knoxville. Zhang won the 2011 Young Investigator Award from the Office of Naval Research through the Department of Defense, with whom he’s working to build the prototype. The study was published in the latest PLOS Computational Biology. “The propulsive efficiency of the species has been claimed in literature to be one of the highest measured for a thrust-generating apparatus within the animal kingdom,” Zhang says, in a direct reflection how little I myself think about animal propulsion. In order to solve the mystery of the insect’s movement, Zhang’s team used high-speed imaging, dynamics modeling, and a series of simulations, revealing some surprises. 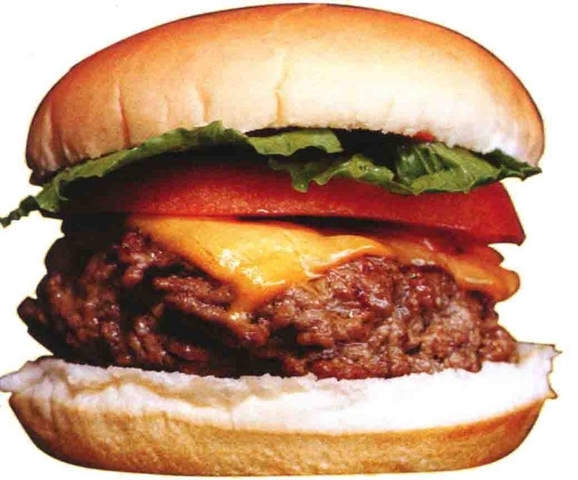 Working in a fast food restaurant has been a part of millions of Americans’ lives at one point or another. Though I’ve had the seldom occurrence where the food’s actual preparation was flawed, the more common errors I experience come from the human element at the drive-thru window (mis)taking my order. So, of course, the company Momentum Machines has invented a machine that replaces fast food line cooks, while doing nothing for the communication factor. Maybe I’m only in a negative mood because I want one of these for myself. Remember the first time you watched Jaws, and you subsequently refused to go swimming for the entire summer that followed? Well, this video of a robotic swimming snake is likely to have a similar impact on many of you. It’s both amazing and horrifying at the same time. Take a look for yourself, and we’ll discuss our impending aquatic doom further on down the page. We try to stay on top of all things robotic here at GFR, so this is the sort of story that puts a big stupid grin on our faces. Because, you see, the robots are coming. Scratch that; they’re already here. 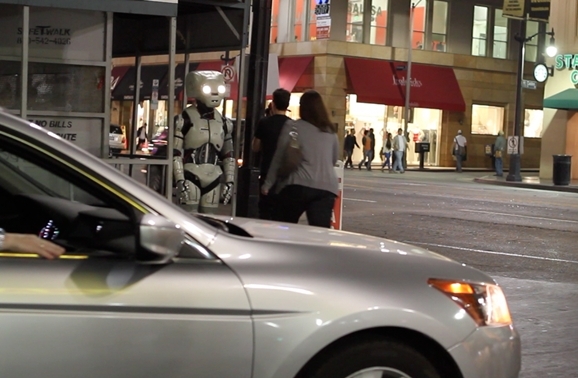 Yes, during the last couple of days a series of mysterious robot sightings have been reported in and around Los Angeles. Robots hailing cabs. Robots exiting the subway. Robots lurking around darkened parking lots. Why are they here? What do they want from us? Is there some reason they seem so keen on public transportation? And does anybody have an EMP bomb we can borrow for the GFR security bunker? Even if you’ve never heard them called by name, or even have no idea who Isaac Asimov was, I guarantee you’ve seen some version of his Three Laws of Robotics, whether in film or TV or games or literature. The Three Laws form a common backbone of programming that is designed to keep robots from killing all humans. Of course, it seems people or ‘bots are always finding ways to skirt around the Three Laws, which has made for some great stories over the years. Here’s a great little gem from the untraveled corners of the interwebs: a young Isaac Asimov explaining the Three Laws. Take it away, Isaac.